To enter, simply tell us the milestone anniversary Hilton Lake Taupo is celebrating this year. 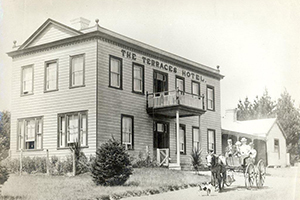 Taupo's historical Terraces Hotel, now Hilton Lake Taupo, dates back to 1889 when the original property was built as an upscale hotel. Terraces Hotel became a regular stopover for McCauley and Crowther coaches, a popular spot for the early pioneers of international travel, and anglers from England and Scotland. Boasting itself as 'the only hotel with hot water on the premises', tall tales of huge trout being caught in mammoth numbers were expounded around the fireside over a few beers or whiskies, as the hotel provided an atmosphere akin to a Scottish fishing club. The Terraces doubled for many years as Taupo Post Office and a number of landmarks in Taupo are measured from the Hotel, such as Two Mile Bay and Five Mile Bay. Despite numerous face-lifts, this grand building still exudes its original grace and style on a magnificent site with awe-inspiring views of Lake Taupo and the mountains beyond, from one aspect, and the thermal valley and Mount Tauhara to the east. The most recent enhancement has been the addition of 100 new rooms and apartments to create a Mountain Wing. The Mountain Wing is positioned alongside the Heritage Wing with panoramic views over Lake Taupo and to the volcanic mountains of Mt Ruapehu. The renovations saw the introduction of international management brand Hilton Hotels & Resorts from November 2009 onwards. The hotel now combines the Victorian grandeur with contemporary comfort, five-star facilities and impeccable Hilton service. In commemoration of the hotel's 125th anniversary of personalised service to visitors from around the world, Hilton Lake Taupo has provided a fantastic offer for meeting organisers to save and be rewarded this winter. Special Offer: Book a winter business event in 2015 at any participating hotel within the Hilton Portfolio in Auckland, Lake Taupo or Queenstown and save with 10% discount off daily delegate rates and a number of complimentary inclusions. From free Wi-Fi connectivity to Valet Car Parking services and mulled wine upon event completion, hosting a memorable event has never been as rewarding.